One of my August goals was to participate in 3-4 Twitter chats per week. Goal accomplished and smashed! I participated in about 5-6 per week. I know it sounds daunting, but for me it was very manageable. I love Twitter chats because it's an opportunity for me to interact with and learn from influencers in the areas of blogging, social media, business and more. I can jump into a conversation or just lurk also known as listening. Doesn't matter which I chose, I always leave a chat having learned something new. I learned some tips to help enhance my blog and my brand. Create a style guide. In the #altchat and #ElleChat, I learned that I needed to create a style guide. A style guide is set of guidelines and standards used define the look and feel of a brand. As someone who's only been blogging for a few months, the idea of creating a style guide was foreign to me. A style guide should include the primary and secondary colors of the blog; fonts used for the body of the text and headings in addition to the tone. I'm currently working on my style guide; it's now my September goal. LOL. If you have any tips or advice, please share. I found great tips for creating a style guide at Camp Fire Collective. Use bit.ly to create shortened links when posting content on your Instagram bio to track conversion to your website. This is a great tip for anyone looking to monitor the impact of their Instagram marketing. Also, the shortened link just looks cleaner. In a #BlogElevated chat, I learned about guest posting. The recurring advice was to find a blog or blogs you'd love to partner with, regardless of niche. If you're a beauty blogger consider guest posting with a pet blog...this gives you the opportunity to flex your creative muscles while exposing yourself to a new audience. I haven't done a guest posting yet so if you're looking for someone, I'm totally interested! Consistency. Your brand should be represented consistently across all platforms, social media and beyond. Use the same profile pictures, logo, fonts, and colors; essentially you're extending your blog's style guide to every platform that represents your brand. Automated Messages. Social media is intended to promote conversation and create "a social" environment. Can you convey this sentiment with an automated message? I use an automated message, via Crowdfire, to thank new Twitter followers but never thought about making it funny or personable. After receiving a hilarious automated message from another Twitter user that prompted me to respond to him almost immediately to let him know how funny I thought it was. I decided to change mine to something softer. It's a subtle change but I've received a lot of positive feedback but more importantly laughs. Snapshot (before and after) of my Crowdfire automated messages. 6. Social media automation. Thanks to a Twitter users recommendation, I use Tweet Jukebox to automate tweets. It's easy to use and they provide you with a list of motivational quotes should you need help with creating tweets. In the past, I preferred to post my updates to social media manually and in real time. However, this isn't easy to do when you have to write blog posts and manage all the other aspects of blogging while working full time. During last week's #TwitterSmarter chat I learned about Tailwind. Tailwind allows you to automate pinning to Pinterest. I used it for the first time this weekend and I have to confess I love it! I scheduled preselcted pins for the week and can change them as needed. It makes my life easier while allowing me to contribute to my Pinterest community without pressure from my massive to do list. Scheduled pins on my Tailwind dashboard. Twitter is my favorite social media platform because I've learned so much simply from networking with others. The experienced bloggers, social media strategists, entrepreneurs and influencers are full of advice and knowledge which they willingly share. Information is shared freely and I'm always excited to absorb it. If you pop into a chat or two, please be sure to say hello. Hope to connect with you there. Have you used Tailwind or Tweet Jukebox? 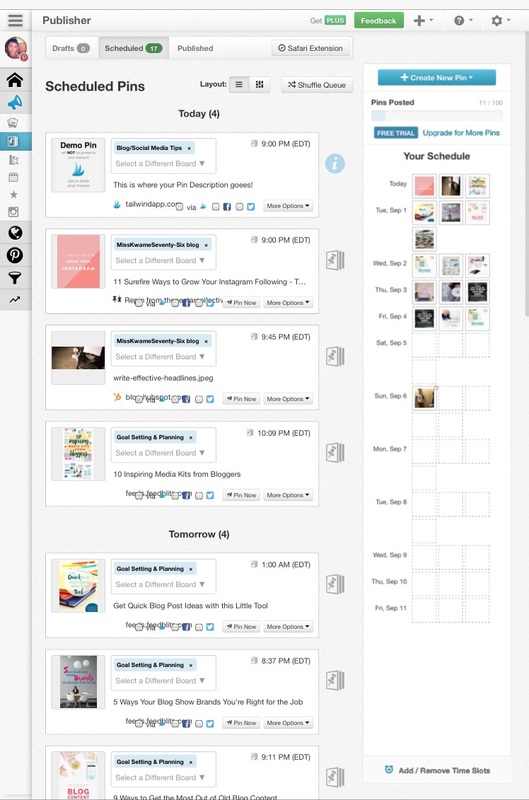 Which social media automation tools do you use? Have you jumped into a Twitter chat yet? As always, please share I'd love to read your experience.